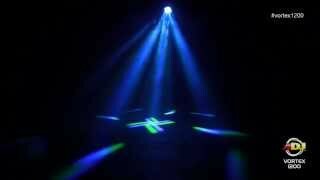 The ADJ Vortex 1200 offers a new dimension of excitement for nightclubs, bars, stage productions and mobile entertainers. 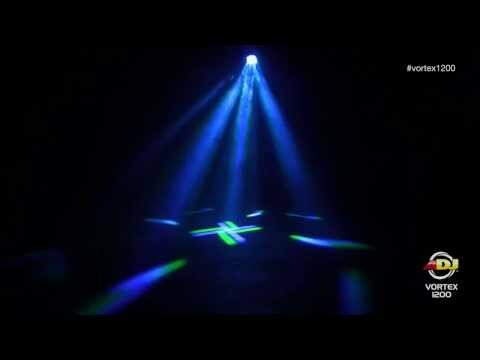 This unique Moving Head produces a Moonflower type effect that sprays hundreds of colored beams of light across a room or dance floor. The Vortex 1200 uses twelve 10W RGBW (4-IN-1) Quad color LEDs. It’s 16-piece lens kit continuously rotates back and forth creating pure lighting excitement. Other features include: zoom (5 ~ 44-degree beam angle), fast pan/tilt, 3 operational modes, 4 DMX channel modes, 23 built-in color macros, 4 show modes and 5 selectable dimming curves. The Vortex 1200’s quad LEDs are rated at 50,000 hours, the maximum power draw is 174W, and up to 4 Vortex 1200’s (@ 120V) or 8 Vortex 1200’s (@ 230V) may be power daisy-chained together via the built-in PowerCon connectors. The unit includes an Omega bracket for mounting on truss or stands. Considering purchasing the American DJ Vortex 1200? Have questions? Ask people who've recently bought one. Do you own the American DJ Vortex 1200? Why not write a review based on your experience with it. Seen a video for American DJ Vortex 1200 online or have you own video? Check out American DJ Vortex 1200 on DJkit.com!